I am off traveling and am currently writing from my home away from home, Boise, ID. Every time I drive across the western United States I am reminded of two things: the American West is the most beautiful place I have ever been and that those who believe in overpopulation are full of crap. There is plenty of room in Wyoming, although they may not want you moving in. We stopped off at Little Big Horn battlefield outside of Hardin, MT. This is a return visit for me. The first time was in 2001. In anticipation of the visit I read an account of the battle by Stephen Ambrose (it must have been in this book) and also the book Son of the Morning Star, which focuses on Custer. I found both to be quite helpful. The topography of the battlefield is such that armed with some knowledge of the battle you can easily envision how things went down. Both of my visits have also included excellent presentations by the Park Service guides who give you the background of the battle. This time we stopped off at the "general store" near the battlefield. This is not a government store, I presume. One thing struck me about the store. Of course it sells the typical tourist items: shot glasses, magnets, t-shirts, etc. Many items, especially the t-shirts, had images mocking George Custer. One, for example, has Custer running away from Indians with arrows almost embedded in him. He is on a cell phone and is screaming "Can you hear me now?" Clever. Another has Custer next to a brave who has cut off a swath of Custer's hair. I forget the caption, but it was something about giving Custer a haircut. There were other items making fun of Custer that I can't recall in enough detail to note them. It struck me how the worm of political acceptability has turned. I suspect that, say, 40 year ago one would still have heard what a great hero Custer was and the t-shirts would have sung his praises and noted the bravery of his men. Now the "general store" is mostly filled with Indian themed goods (the store might be run by the Crow reservation, which would explain the items in the store) and there are few items solely commemorating the 7th Calvary. And while in decades past it may have been acceptable to mock the Indian braves (probably with stereotypes of "ignorant savages") now they make fun of George Custer. This is a big change. I am not sure whether it is a change for the worse, a change for the better, or simply a change (to be clear, the end of Indian mocking is a good change). It did bother me to see Custer mocked as a fool and buffoon whose death is now a subject of humor. George Custer was many things. He was arrogant. He was brash. His arrogance led to the deaths of many men at Little Bighorn. But Custer was other things, for example a Civil War hero. It was just that arrogance and brashness that made him such an effective calvary officer during the war. This man was at Gettysburg fighting for the Union. 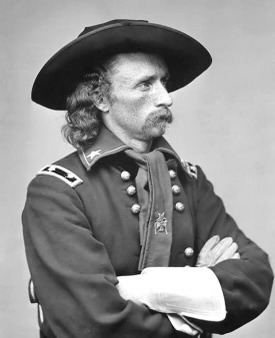 Under Phil Sheridan, Custer helped destroy Confederate calvary during the last year of the war. Granted, he blundered greatly at Little Bighorn, but should we make fun of this American soldier and by extension ridicule those who served under him? It bothers me to see the deaths of American soldiers being turned into the object of humor. It is possible that I am overreacting. Perhaps I should have more of a sense of humor about this matter. Often conservatives tell the political correctness police to lighten up and not take every slight so seriously. Perhaps it is time Prof. Schaff take a dose of that medicine. I'd appreciate thoughts. Email me at schaffsdp at gmail.com. I will post thoughtful responses. Just note that I am out of town and have limited access to computers, so it might be a while before I get to this. Update: I just noticed Jason's post above. Look to the right and you'll see links you can click on to email any of us on the site. Oh, and GO BIG RED!